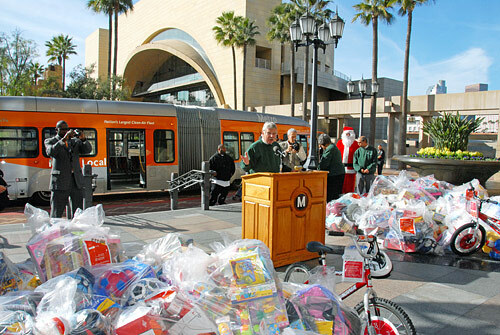 Metro employees this morning donated more then 2,000 gifts for children and needy families served by the Fred Jordan Mission in downtown Los Angeles. The event took place at the entrance to Metro’s Gateway headquarters where pre-school children from the Metro Day Care Center, the Metro Choir and volunteers helped to create a true holiday atmosphere. Presiding over the ceremony were Metro CEO Art Leahy, Metro DEO for Diversity and Economic Opportunity Linda Wright and Willie Jordan, president of the Fred Jordan Mission. Most of the gifts were blankets, table games, and football, basketball, and soccer balls, as well as two bicycles. The 14th annual effort to begin collecting gifts was organized by the Metro Diversity and Economic Opportunity Department with a team headed by Tashai Smith. A 60-foot Metro bus was used to transport the gifts to a warehouse. Then, on December 22, the Fred Jordan Mission will hold its annual delivery of toys to children and families.